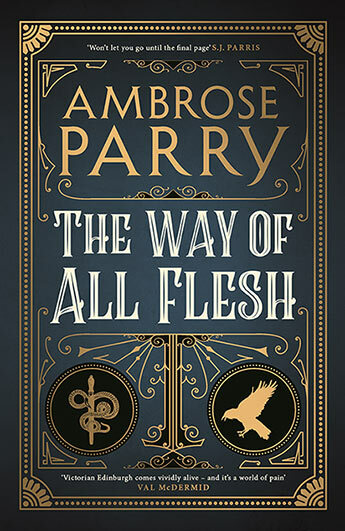 Ambrose Parry is the pen name of multi-award winning Scottish crime writer Chris Brookmyre and his wife Marisa Haetzman. It was Haetzman’s research into medical practice in Edinburgh in the 1850s that put the two down the track of collaborating on a novel set in the period. Being a crime novel, The Way of All Flesh opens with a death – a prostitute named Evie, found by one of her regular clients, but also friend, Will Raven. Raven runs from the scene, straight into the arms of the debt collectors looking for repayment of the money he had borrowed to help Evie out. Raven is hoping that his new apprenticeship with famous “male midewife” (aka obstetrician) James Simpson, will help him earn the money that he needs. In Simpson’s house, which also serves as his clinic, is housemaid Sarah who has the capacity to be more and yearns for something better. It takes some time for the murder mystery to come into focus. Some news about other deaths slowly builds in both Raven and Sarah a suspicion that something strange is afoot. They form a loose partnership as they tentatively investigate. Both characters are engaging and distinctive enough to avoid usual crime fiction stereotypes even when navigating some familiar plot beats. Regular crime readers will pick this one pretty early on. But the draw of this book is not the plot. Rather it is the use of the crime genre to explore the development of medical techniques at the time. Parry charts the early use of ether to assist with pain in childbith and moves on to the discovery of use of chloroform. On the way, readers are treated to some fairly gruesome and explicit birthing techniques and surgery without anaesthetic. Parry creates a great feel of the Edinburgh of the time, including the upper class New Town and shady Old Town. In particular the book explores the development of the medical profession as it transitioned from glorified butchery to something more respectable. The bodice ripping (at times) plot allows for a fun and interesting exploration of attitudes and beliefs of the time. And the afterward suggests that there is plenty more source material to build a long running series around.